Heather entertains in care homes across the island and has a special affinity with this age group. She is a singing and piano teacher who trained at the Royal Academy of Music from age 12 when she was awarded a Junior Exhibitioner Scholarship. Heather sings with Cantata and Ryde Chorus and has run vocal sessions in Northampton, from where she moved to the Island in 2014. Heather passionately believes in the ability to access positive memories through music and song. Just like a strong aroma, a song can immediately transport you to the time when you enjoyed it and spark associated fond memories. Heather's musical interests spread from the American Songbook, British and American Musicals, musical theatre, songs from World Wars I and II to folk songs of the United Kingdom. She is a fan of artists like Ella Fitzgerald and Judy Garland and sings some of their repertoire, accompanied by her father at jazz nights in Sandown. Verity is an architect and was a university lecturer before leaving full time employment and becoming self-employed. She founded the Wight Ukers ukulele group on the Island in 2013 and started leading singing sessions, mainly in care homes, for Independent Arts in 2017. Music, and especially singing, have always been a favourite leisure occupation, from singing in school choirs from about the age of 8, through performing with Batley Gilbert and Sullivan Society between 1985 and 2002, when she moved, with her family, to the Isle of Wight. Verity's repertoire ranges from Victorian music hall right through to the present day, though for care home sessions music mostly starts with 'hits from the blitz' running through to the 1960s and sometimes, '70s. She aims to choose music to suit the session and the ages and preferences of participants. Good, singalong numbers prove particularly popular. Verity's mother suffered with dementia, and she has a particular interest in how music can make connections, even when cognitive ability seems to be severely impaired. Lizzie entertains in care homes across the island as a singer and musician. She has been engaged in musical activity all her life having performed in Musical Theatre productions since the age of 12. She has sung with many choirs and plays the piano guitar and cello. Lizzie retired from her business of 10 years, Fasbat Musical Theatre Company which provides classes for adults and children five years ago, and moved to the Isle of Wight to write and develop an educational programme. She has been involved in community projects in St Lawrence where she now lives, producing and directing the Christmas entertainment at the village hall. Lizzie also leads Independent Arts' Ventnor SingAbout group. Steve is a former mathematics teacher but has always had a passion for music and putting on concerts. For many years he performed with his band Easy Street as lead vocalist and rhythm guitarist covering a range of material from Jazz to Rock’n’Roll. A keen songwriter, Steve has also written and recorded two albums. Steve joined our practitioner roster in June 2015 and performs songs from early 1920s favourites to the swinging 60s and engages his audience by encouraging singalongs and percussive participation. 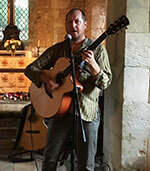 Philip's sessions comprise upbeat and catchy songs of various styles and from different eras to suit client choice. Simple percussion instruments can be used if clients have shown an inclination to clap or beat the rhythm. Sessions are always enjoyable and designed to be socially inclusive, with the emphasis on participation. Music and movement from a musician and qualified dance and movement practitioner. Zarah's background was in classical dance and she ran a ballet school on the island before moving to Scotland where she taught the piano to private students and ran keep fit classes to all age groups. Zarah has an Honours Degree in Music and the Arts and is now back on the island teaching the piano. Zarah believes that the love of music and movement can benefit everyone. In her music workshops she can bring her keyboard to play familiar songs, light jazz and classical music for residents to join in with or to just listen to and relax. Her movement workshops involve gentle and expressive chair-based movement that will exercise and stretch every part of the body whilst listening to great music from the musicals and the jazz era. Always winding down, at the end, with breathing exercises to relaxing music. Zarah can combine a session to have both movement and music included. David was a journalist before becoming a civilian press officer for the Armed Forces. His interest in music started as a choirboy at Exeter Cathedral; he got his first guitar at the age of 15 and over the years has collected a variety of other stringed musical instruments. Now retired from full-time work, he plays the guitar, banjo and sometimes the mandolin. His style is varied and includes music hall, rock and roll, folk and the occasional humorous ditty. Merlynna returned to Independent Arts after several years on the mainland. She plays the harp and sings, choosing the repertoire to suit the group. Harp music helps to reduce anxiety levels, reduce pain and create easier breathing for most people. Merlynna can perform for groups, or interact with the group using a small lap harp that clients can play so they experience for themselves the wonderful sounds the harp can make. I first picked up the saxophone when I was nine years old. From the age of 13 I was touring in Germany and the passion hasn't stopped. I achieved the diploma in performance from London college of Music at age 16 and then the high national diploma for Jazz Performance aged 18. I graduated with a Jazz BA degree at Middlesex University and love the art of improvisation. I believe that playing jazz standards brings the sense of nostalgia for a time where music was more free and lyrical. I use improvisation to revive the glory days of Miles Davis, Ella Fitzgerald and Charlie Parker. 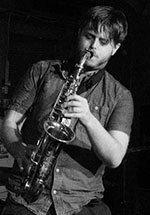 I have toured the south coast playing jazz music and jazz compositions and I have performed in an arrange of places from the cocktail bars of Brighton all the way to the Vortex jazz club in London. I love to play Latin, samba and sometimes The Beatles. 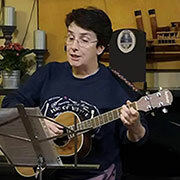 Margaret Jones has many years of experience as a singer and performs songs old and new, accompanied by a gentle, acoustic guitar. Songs to listen to and songs to sing along to, all evoking memories and bringing the joy of music into your home for your residents. Songs span the years from the 1940s to the present day, so there's something for everyone's taste. Glenn is a self-taught musician, playing guitar and singing for 40 years. As part of the duo, Coppersmith, he performs regularly at festivals and folk cubs playing his own songs. He studied at Portsmouth University and Chichester University where he gained a degree in Community Arts. 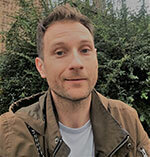 Although he has worked in many areas of the Arts he has developed a particular interest in therapeutic arts and has taken several courses in counselling to move his practice forward. Glenn believes that "When we have difficulty communicating, music and art can help connect us to our memories and feelings, and to those around us", so Glenn tailors his work to the individual, or to the group, to maximise engagement, trying out new songs and activities and involving support staff where possible. John was born and raised in London, where he left school with no qualifications and went on to work as a plumber/gas fitter for 35 years, followed by 10 years as a postman. John moved to the Isle of Wight in 1998, where he achieved his City & Guild in English and Maths. He is self-taught in a range of musical instruments, which he uses in his sessions. In his spare time he is kept busy with his five children, 13 grandchildren and two great-grandchildren. 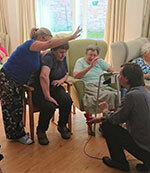 John delivers workshops for Independent Arts in music and movement. In his sessions he likes to create a happy, relaxed atmosphere and encourage participation in music and gentle movement. He enjoys celebrating birthdays and anniversaries, prompting nostalgic anecdotes about times past and family memories. He says, "I’ve personally learnt a lot from these sessions: that I’m a good communicator and my enthusiasm is infectious! I seem to bring out the best in people." Tony has travelled the world as a professional singer/guitarist. He has worked as a solo performer and as part of duos, trios and bands. Now retired to the Isle of Wight, after 30 years living in Norway, he performs at a number of venues on the island and does some volunteer work for the British Heart Foundation and the Quay Arts centre in Newport. His music varies, from folk and country, to blues, ballads and popular songs of the '50s and '60s. He also works, as a duo, with his partner, Anita. Tony is great believer in using music as a therapy: "Nothing triggers memories, as much as a song." He has performed around the world and shared a stage with stars including, Eric Clapton, Jack Bruce, Mike Harding, Suzi Quatro, Jasper Carrot and Fred Wedlock. Annette has been singing professionally since age fifteen, working with big bands, on cruise ships and with Thompson holidays, as well as appearing alongside entertainers such as Tommy Cooper, The Three Degrees and other big name acts. Her passion is to bring people together to enjoy music, and make singing fun, and she brings her vast experience and enjoyment of music to her sessions for Independent Arts. Steve is an experienced musician who delivers our Soundbeam sessions, which enable clients with profound physical or learning disabilities to become expressive and communicative using music and sound. Find out more about Soundbeam here. Sara's music career started at school, performing in school choirs and taking lead roles in productions. Over the years she has sung in bands, duos, and as a solo artist. Sara has worked in the care industry and has a good understanding of dementia and working with the elderly. Sara offers an hour of music with songs to sing along to and show songs combined. The songs range from 1940s, '50s and '60s through to the present day. Throughout the songs set Sara engages with the audience to discuss memories and will often include a quiz to get participants thinking about the music and engaging with each other. John taught on the Isle of Wight for 33 years and is keen to pass on the skills he acquired during this time. He enjoys poetry, joke-telling, singing and playing guitar in equal measures. He enjoys the company of the elderly and creates an enjoyable and reciprocal ambience during sessions. John's sessions offer a variety of songs ranging from folk/pop to old time music hall. Singing sessions are accompanied on the guitar. Participation is offered through percussion instruments and specialist rhythm work is available, from handclapping to ethnic drumming. Sessions can be varied to suit client tastes and ages. Poetry readings are also available; these can be humorous or more reflective verse. From guitar to aerodrums to a simple shaker, Max gets everybody involved with music making in his sessions. Singing is usually the common ground, but not necessarily. Max adapts to different clients' needs to maximise the benefit they get from the sessions. Previously Max's bands have shared the stage with some big bands such MUSE and OSRIC TENTACLES, and he as a degree in Creative Music Technology. He likes theatre and philosophy.